We have a Rabbit problem! Wiggonby Class one children spotted a Rabbit on the field. Where had it come from? How many were there? We started to read "The Rabbit Problem " by Emily Gravett. We wondered if this was going to happen to Wiggonby school field! We looked at other stories with rabbits in. Our other classes were also looking at the Rabbit Problem story. Jamie, one of our year 4 children, was also looking at Peter rabbit. He and Mrs Morrey made a model of Mr McGregor's garden to retell the sort. When he had finished he said our class one children could use it for small world play. The children in class one enjoyed adding to the garden and acting out the story. Class one children also found out about Emily Gravett. She has written other books and used to live on a bus! 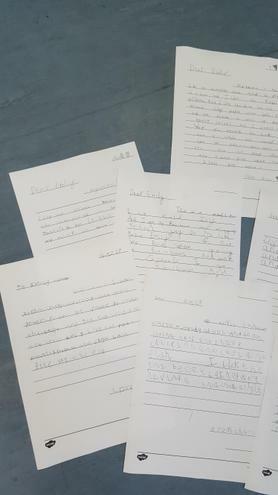 We wrote letters to her to tell her about our rabbit problem and ask her about her book. 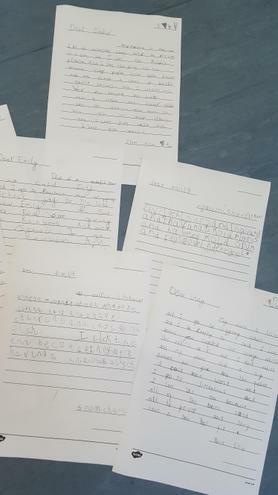 We did some AMAZING writing in Reception and Year one!